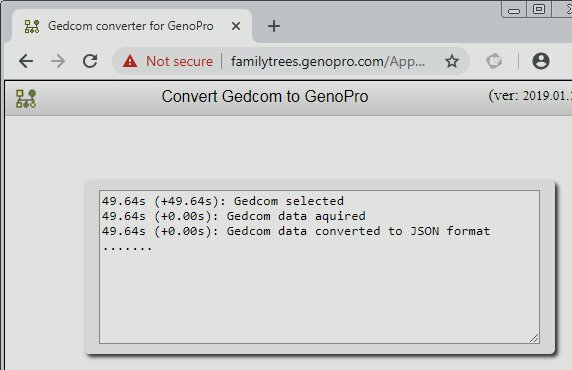 This is an open thread for discussion and support of the Gedcom to GenoPro converter introduced here. Hmmm, looks like the Gedcom to JSON parser that I 'borrowed' from elsewhere does not like lower case in the tag identifiers e.g. @ind00001@ but @IND00001@ is OK.
Not sure if this is in the Gedcom spec. but I will change it to allow lower case. Update: script has been amended. Just make sure you clear your browser cache before retrying. Took me some time to find the result. I was taking files from D: and the result was in C: Downloads, which, after searching, I find can be accessed from the the program. Doh!! An option to place the gno file in the same folder as the ged file would, in my case, stop filling up the Downloads. To repeat conversion I had to refresh and then click the opening message box. I will look into having a rerun option button but I suggest you merge your many .ged files into a single .ged by copying and pasting the contents, excluding the HEAD, SUBM AND TRLR entries from all but the first and then converting that. Tried merging ged files but have lost the family structure. Do you have unique IDs for each Individual and family in your .ged files? Does GenoPro's own gedcom import produce something different? When you think about it the problem here is that each original gedcom has the same set of ids so the family tags will be very confused when they are combined. Importing my original gedcom into GenoPro works well with minimum keyboard involvement and the display is as expected. The only problem is that the RESI tag ends up in the Custom tags. The corrected ged2gno files open correctly but each one is in a new file. I have tried dragging - same result a new file is created and also import but that only recognizes ged files. I suspect that for my case I might need to look again at my original idea of importing the gedcom and editing the xml file. In theory there is only one change needed but it affects several parts of the file; place & source, but need closer look. I edited a ged file to change numbering of @ind & @fam tags and this combined file opens correctly. Not a viable solution, although it does show what is needed here. But I notice that when GenoPro imports RESI tags it ignores the SOURce tag and when importing OCCU as Occupation it ignores both SOURce and NOTE tags ! !